About 5 years ago I 'retired' in my late 20's from my career in museums to have my children. I'm now a stay at home mum to Thomas (4 years old) and Emily (2 years old - who's catch phrase is currently 'I do it myself Mummy'). We live in my husband’s home town of Northallerton in North Yorkshire. It’s a wonderful market town with a largely independent high street and a great sense of community. While on maternity leave I had this amazing idea. I’ll make stuff to sell at craft fairs - like no-one's had that idea before eh?! Anyway, I went on my merry little way researching fairs. I tried to get my sewing machine out in our open plan 1970's style home and soon discovered that my toddler had an almost magnetic talent for finding stray pins. I realised it might not be as easy or romantic as I thought to turn my kitchen table into a one stop crafting studio each evening. For the most part I found that many craft fairs were actually, well, a bit crap. Expensive to attend, poorly marketed, open all day (alert - childcare issues!) and lots of people selling imported gift items not crafts at all. Worst of all, two traders selling very similar goods at very different prices. I began to question what some event organisers were up to. And did the stall holders not realise they were the customer in this relationship and should expect, and demand, more. But maybe it was just me. After all I was once described as the Star-ship Enterprise of girlfriends because I am so high maintenance. Not by my husband I might add! Enraged I decided 'I can do a better job!' So, I did. By combining my skills as a curator, my love of craftswomenship (not yet in the dictionary) and my links and insights into the world of motherhood I created Made by Mummy Markets, an affordable market place for crafting mothers to sell their creations. I knew that the internet would play a key role in my business. It would give me the freedom to keep obscure office hours and no one would know I was writing that press release while covered in someone else’s snot. The internet had already done me one good turn. I met my wonderful husband, David, on Match.com and we wed within 18 months. We often chuckled to each other about our ‘digital fairy tale’ in our smug little moments. I got to work and started planning my first market. Not a fair or fayre but a market; a place you go to buy or sell wonderful things. At the heart of my plan was the idea that these events should work for mums like me. I open my markets for the afternoon only so we are busy and bustling without having to man a stall for 7 hours and miss 3 meals at home. I take applications (not bookings) for stalls so I can curate an event where each maker compliments rather than competes. And I work my backside off marking the events as destinations for customers who want to buy quality, unique, hand made goods fresh from kitchen tables around the region. Since my first event in May 2016 traders have taken £10,000 at my markets! I am very proud of that. The hardest part of my job is often the selection of makers. I get 30-60 applications for each event, and normally have 25-30 stalls up for grabs depending on the venue. I am keen to work with established businesses as well as newbies giving it a go for the first time. I work hard to give everyone a chance, balancing the need to allow new talent a turn and working with trusted and popular crafters. I am sad to say that this process has cost me at least one friend, but on the whole, it works, and I hope very much to heal that wound one day. Like most of the women I work with the main challenge I face is profitability. Earning money doing this makes the difference between an expensive hobby or a successful business that makes more money than it costs. I am sure my story would have taken a different route if it were not for the support of other more established and inspiring business women who have helped me. Not least Jessica Barker, owner of Thief Hall who helped me get started by using her wonderful wedding venue to host my markets. Her generosity helped me to bring an air of quality and luxury to proceedings which has undoubtedly impacted on the sales of the traders at my events. Made by Mummy Markets is now my part time job which I fit around the kids. My profits fund some home improvements, treats and much goes back into the business. As my children reach school age and I have more daylight hours to play with I plan to take it up a level. Being a mum and an entrepreneur is not easy, but it has its rewards. No one tells you about the challenges of motherhood (or your naive ears don’t listen). The huge quantities of other people’s bodily fluids you’ll have to deal with or the total and constant invasion of your personal space. On a daily basis I felt at times frustrated, under stimulated and guilty for feeling this way, which often made me grumpy. Grumpy but sure I wanted to be a stay at home mum and happy at the same time to be in this position. It’s little wonder that mums find it hard. Riding the daily (and nighty) rollercoaster of sheer joy and total exhaustion left me feeling conflicted. As a ‘modern’ women I was independent. I had a degree, a job, passions, hobbies, heck I had disposable income. Being a mum doesn’t mean that none of this happened, but you are a different person to the young wild thing you once were. 1. Family first. This might mean you have to say no to some opportunities, or at least no right now but maybe later. Don’t forget why you are working in this way in the first place. 2. Embrace the web. Social media, cloud accounting and email are your magically midnight office friends. 3. Get a business bank account as soon as possible! It really helps to keep your finances in order, visible and separate from your household. 4. Don’t drink wine and work on your social media at the same time! 5. Research support in your area. I bet you’ll be surprised to find business and economy staff in your council, trading standards officers, training bodies/adult learning, and local business networks. Oh and did I mention the WI!? Perhaps another time. 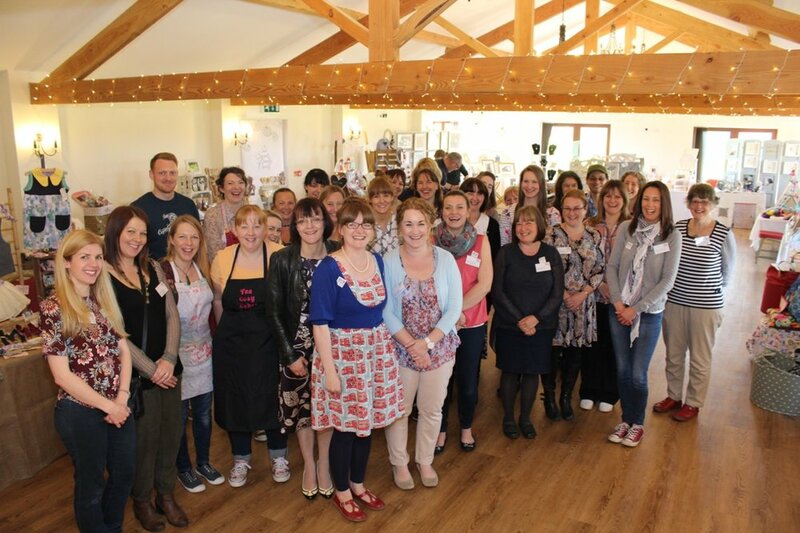 Samantha is holding a Home-made Business Conference, a day of inspirational and expert speakers for those running small craft businesses from home. Featuring speakers on the themes of product labelling and the physicology of marketing, visual merchandising at craft fairs, trading standards online, process mapping and local press coverage. September 25th in Northallerton, Click here for more details! Caboodle Magazine, for all the things we love that make us smile!